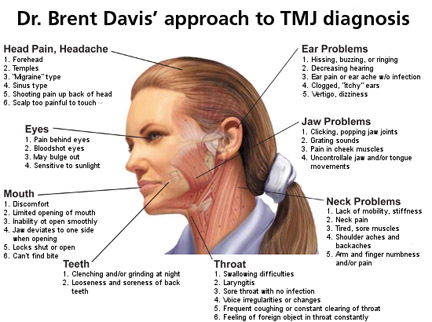 The jaw joint, or temporomandibular joint (TMJ) is very complex from a neurological perspective. It has a huge number of connections to the cerebral cortex, and when the TMJ malfunctions it can, by reflex action, influence many different parts of the body. Refer to the adjacent image. If you would like to meet Dr. Davis and desire more information before committing to care, just ask to be scheduled for a brief complimentary consultation.